Stephen Waxman is the Bridget Flaherty Professor of Neurology, Neurobiology, and Pharmacology at Yale University, and served as Chairman of Neurology at Yale from 1986 until 2009. He founded the Neuroscience & Regeneration Research Center at Yale in 1988 and is its Director. Prior to moving to Yale, he worked at Harvard, MIT, and Stanford. He is also Visiting Professor at University College London. Dr. Waxman received his BA from Harvard, and his MD and PhD degrees from Albert Einstein College of Medicine. His research uses tools from the “molecular revolution” to find new therapies that will promote recovery of function after injury to the brain, spinal cord, and peripheral nerves. Dr. Waxman’s research has defined the ion channel architecture of nerve fibers, and demonstrated its importance for axonal conduction (Science, 1985). He demonstrated increased expression of sodium channels in demyelinated axons (Science, 1982), identified the channel isoforms responsible for this remarkable neuronal plasticity which supports remission in multiple sclerosis (PNAS, 2004), and delineated the roles of sodium channels in axonal degeneration (PNAS, 1993). He has made pivotal discoveries that explain pain after nerve injury. In translational leaps from laboratory to humans, he carried out molecule-to-man studies combining molecular genetics, molecular biology, and biophysics to demonstrate the contribution of ion channels to human pain (Trends in Molec.Med, 2005; PNAS, 2006). He is part of an international coalition that identified sodium channel mutations as causes of peripheral neuropathy (PNAS, 2012). He has used atomic-level modeling to advance pharmacogenomics, first in the laboratory (Nature Comm., 2012), and then in the clinic in a paper (JAMA Neurology, 2016) that was accompanied by an editorial stating “there are still relatively few examples in medicine where molecular reasoning has been rewarded with a comparable degree of success”. An entirely new class of medications for neuropathic pain, based largely on his work, is currently in Phase II clinical trials. Dr. Waxman has published more than 700 scientific papers. He has as edited nine books, and is the author of Spinal Cord Compression and of Clinical Neuroanatomy (translated into eight languages). He has served on the editorial boards of many journals including Annals of Neurology, Brain, The Journal of Physiology, Trends in Neurosciences, Nature Reviews Neurology, and Trends in Molecular Medicine, and is Editor-in-Chief of The Neuroscientist and Neuroscience Letters. He has trained more than 200 academic neurologists and neuroscientists who lead research teams around the world. A member of the National Academy of Medicine, Dr. Waxman has served on many advisory councils, including the Board of Scientific Counselors of NINDS. 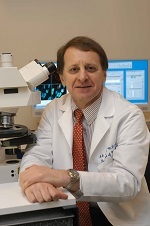 His many honors include the Tuve Award (NIH), the Distinguished Alumnus Award (Albert Einstein College of Medicine), the Dystel Prize and the Wartenberg Award (American Academy of Neurology), both the Middleton Award and the Magnuson Award from the Veterans Administration, and the Soriano Award from the American Neurological Association. He has been honored in Great Britain with The Physiological Society’s Annual Prize, an accolade that he shares with Nobel Prize laureates Andrew Huxley, John Eccles, and Alan Hodgkin.